THE Fiba Executive Committee on Tuesday night awarded the Philippines the right to host an Olympic Qualifying Tournament, giving Gilas Pilipinas the chance to play before home fans when it guns for a historic place in the basketball competitions of the coming Rio Games. Meeting in the world basketball body's main headquarters in Geneva, Switzerland, the all-powerful Fiba executive committee named the Philippines (Manila), Serbia (Belgrade) and Italy (Turin) the hosts of the three qualifers - each one staking a place among the world's best basketball teams in Rio de Janeiro in August. A Philippine basketball team has not played in the quadrennial games since 1972. The Fiba decision atoned for the disappointment of missing out on the opportunity to bring the 2019 World Cup of basketball to the Philippines, which the Samahang Basketbol ng Pilipinas (SBP) lost in a bidding war to China last year. 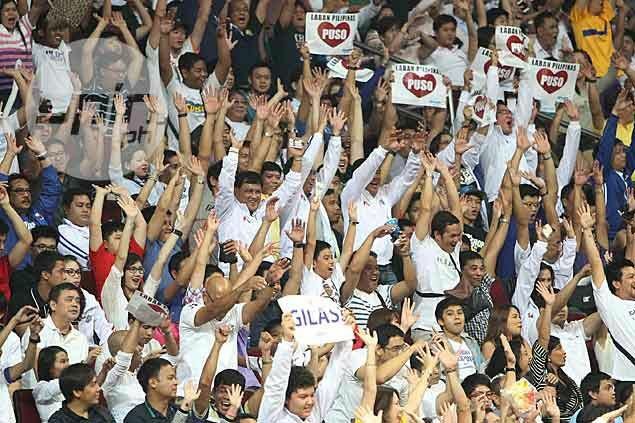 By winning the hosting rights, the SBP will now stage a tournament among six teams at the Mall of Asia Arena in Pasay City from July 4-10, with a lone ticket to Rio at stake. The draw for the tournament will be held a week from now. Samahang Basketbol ng Pilipinas (SBP) president Manny V. Pangilinan was ecstatic in his tweet confirming the country's hosting selection. YES!! PHILIPPINES TO HOST FIBA OLYMPIC QUALIFYING IN JULY. LABAN PILIPINAS! PUSO! According to Fiba, Angola, Canada, Czech Republic, France, Greece, Iran, Italy, Japan, Mexico, New Zealand, Puerto Rico, Senegal, Serbia, Tunisia and the Philippines earned the right to compete in the qualifiers. In line with the final standings of EuroBasket 2015 and the FIBA World Ranking, Latvia, Croatia and Turkey were invited to complete the lineup, Fiba added. "SBP wishes to express its gratitude to Fiba and its Executive Committee for giving us one of the hosting rights for the Rio Olympics Qualifying. We are indeed pleased and privileged to receive this news. I wish to convey to Fiba President Horacio Muratore and Secretary General Patrick Baumann SBP,s assurances that it will do its best in making the event worthy of an Olympic event. We wish our Smart Gilas team Godspeed in its quest to be part of the Olympic movement again. Laban Pilipinas! Puso!"